Clafoutis is a traditional French dessert of cherries baked in batter. It is also particularly good with rhubarb. Roasting the rhubarb with tender young ginger adds so much flavour, and the perfume really permeates the rhubarb stalks. This is a great little dessert for the cooling weather, but it's also very delicate and quite fresh. You will need six 13-centimetre ovenproof dishes or ramekins for this recipe. 1. Instead of rhubarb, you could use cherries or berries, or some cooked apple or pear. 2. You can bake this as one large dish, but the cooking time will vary. 3. Try using hazelnut meal instead of almond meal. 2. Add the rhubarb, ginger and sugar to a ceramic baking dish and toss through. Set aside for 20 minutes. 3. Bake the rhubarb for 10 minutes and rest for 10 minutes. 4. For the batter, add the sugar, almond meal, flour and salt to a food processor and blend for one minute. Add the cream, eggs and egg yolks and process until smooth. 5. Rub the dishes with butter and line with castor sugar. Tap the dishes lightly to shake off any excess sugar. 6. Divide the rhubarb between the dishes and pour over the batter. Bake on the middle shelf for 15 to 20 minutes until set in the middle, puffed up and golden. 7. 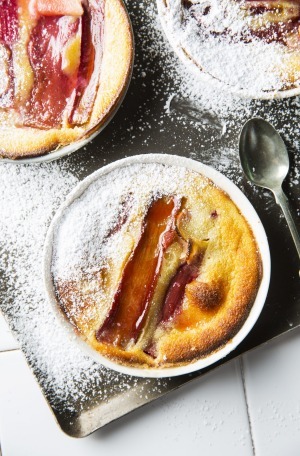 Dust the clafoutis with icing sugar and serve with ice-cream or cream. Drink A late harvest pinot gris.